Modern transport technologies reduce the time to overcome space; measured in units of time, space is 'shrinking'. Time-space maps represent this interaction between space and time cartographically. In time-space maps the distance between two points is not proportional to their physical distance (as in physical maps) but proportional to the travel time between them. This change of map scale leads to distortions of the map compared with 'familiar' physical maps. 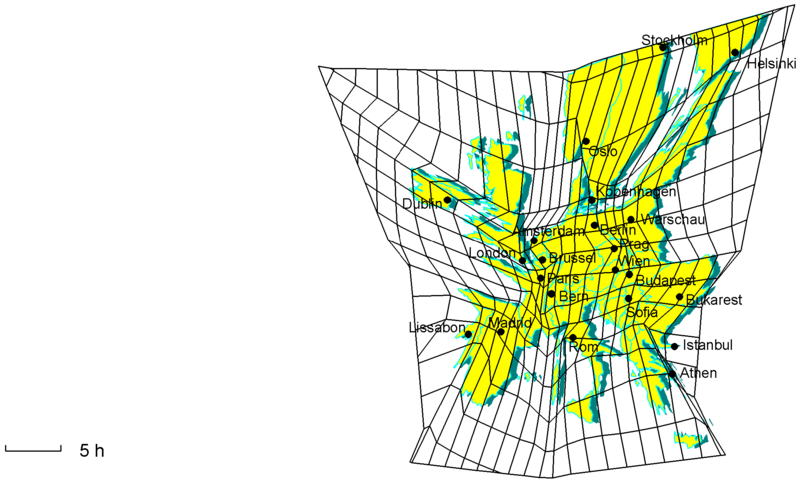 The following three maps show the 'shrinking' of space through the improvement of the European railway network between 1993 and 2020 compared with the base map with constant speed of 60 km/h. 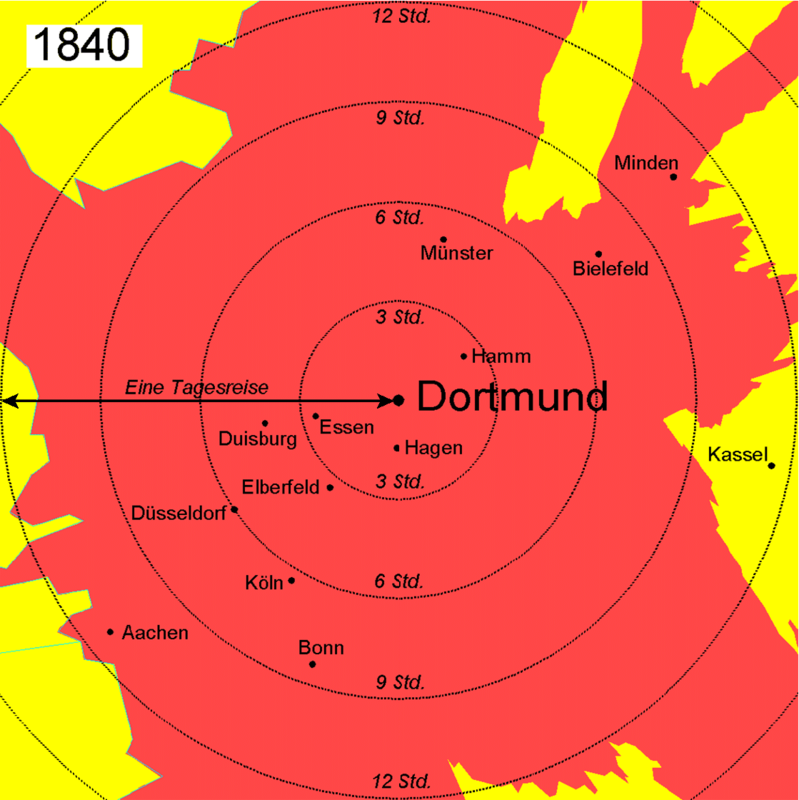 The six following time-space maps are an attempt to visualise the shrinking of space through the railways between 1840 and 2020 from the perspective of Dortmund. 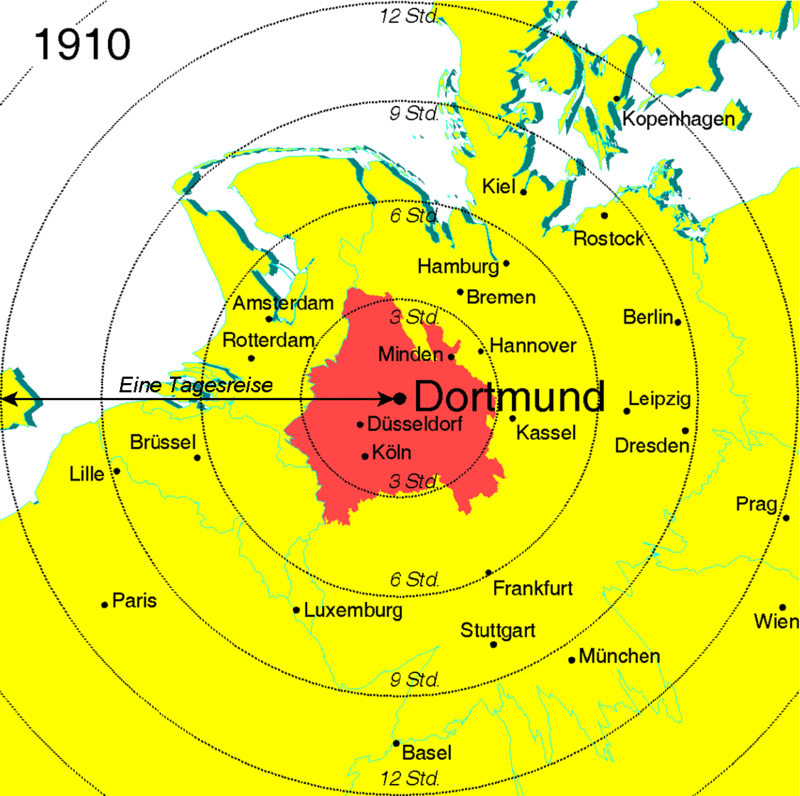 In all six maps Dortmund is in the centre. 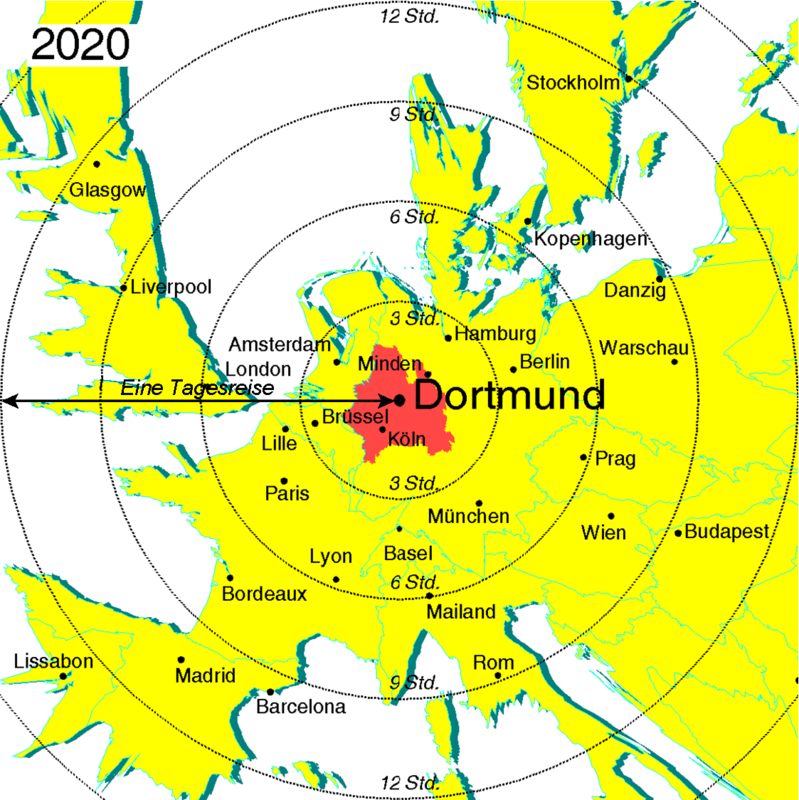 Each map represents the area that could be reached from Dortmund within a day's journey in the indicated year - or will be possible to reach in the future. The red area is the outline of the Federal state of North-Rhine Westphalia of today. 1840. Despite the improvement of long-distance highways in the early 19th century, by stage coach speeds of more than twelve kilometres per hour were hardly achievable. Aachen and Minden represented the outer limits of the area reachable from Dortmund in one day. All more distant cities could be reached only after an overnight stay. In particular in the South the poorly accessible and mountainous Sauerland formed a major barrier between the Ruhr Area and Frankfurt. 1854. The map shows the dramatic expansion of the catchment area of Dortmund through the railways. Now the German and Dutch North Sea ports, the most important sources of raw materials for the Ruhr economy, and the Belgian industrial areas and Berlin, its most important markets, can be reached in one day. 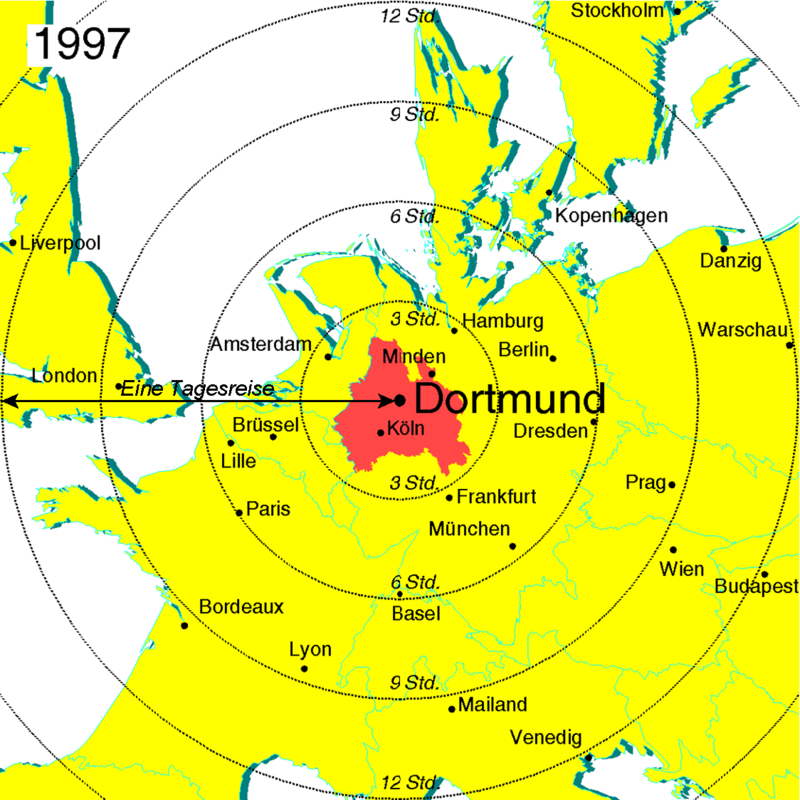 This creates the conditions for the rise of Dortmund as an industrial city. 1910. At the turn of the century the European railway network has been largely completed. 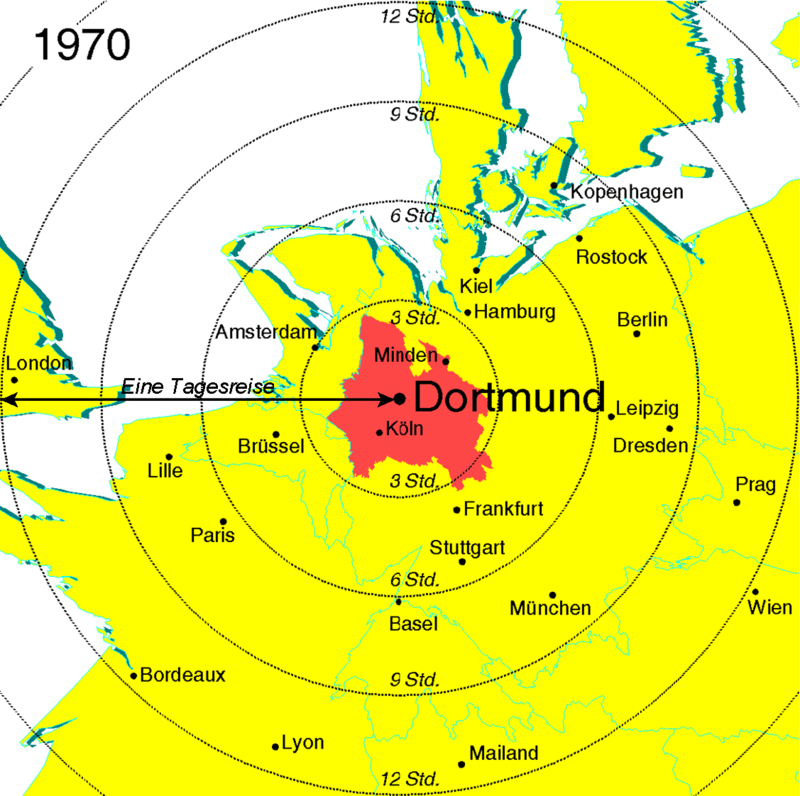 Being an important railway node, Dortmund is located in the heart of Europe. The major European centres Paris, Vienna and Berlin can be reached in less than a day, Scandinavia and England are coming closer. 1970. In the sixty years since 1910 the European railway network has hardly changed, however electrification and faster engines bring another extension of Dortmund's catchment area. London, Stockholm and Milan can now be reached in one day. 1997. The advent of high-speed railways introduces another period of contraction of space. The Train à Grand Vitesse (TGV) in France and the Intercity Express (ICE) in Germany result in many cases in a reduction of travel times by half. The newly opened Channel Tunnel links the British railway network with the European continent. 2020. The improvement plans of European railway companies will bring further acceleration. A network of trans-European high-speed railways will connect the regions of Europe and link formerly remote regions on the Iberian peninsula, in the Balkan and in eastern Europe to the centre of Europe. Travel by the fastest trains will be more than twenty times faster than the stage coach. Europe will grow together - but also in economic and social terms? Contribution to the exhibition "Modern Dortmund - Created by the Railways" commemorating the 150th anniversary of the opening of the railway between Cologne and Minden at the Museum of Art and Cultural History of Dortmund, 16th May to 17th August 1997. 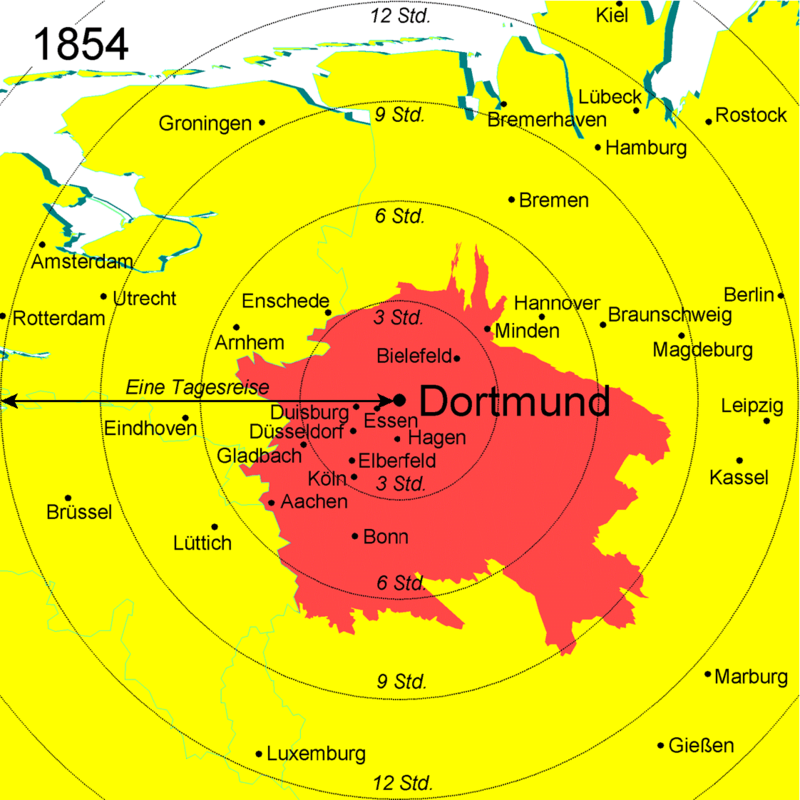 A day's journey from Dortmund 1840-2020. A day's journey from Berlin 1824-2024. Lemke, M., Schürmann, C., Spiekermann, K., Wegener, M. (2005): Die europäische Dimension des Verkehrs. In: Mayr, A., Stadelbauer, J. (Eds. ): Nationalatlas Bundesrepublik Deutschland. Band 11: Deutschland in der Welt. Heidelberg: Spektrum Akademischer Verlag. Spiekermann, K., Wegener, M. (1995): New time-space maps. In: Wyatt, R., Hossain, H. (Eds. ): Proceedings of the 4th International Conference on Computers in Urban Planning and Urban Management, Melbourne. Melbourne: Department of Geography and Environmental Studies, University of Melbourne, Vol. 2, 353-365. 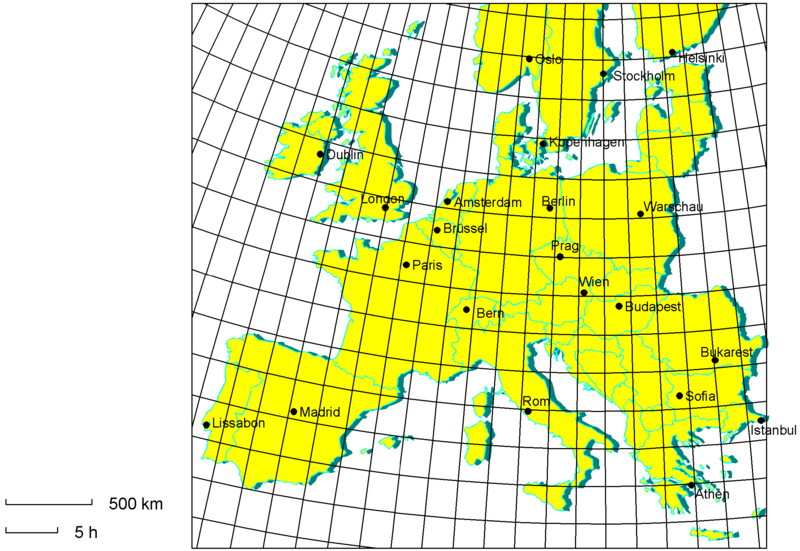 Spiekermann, K., Wegener, M. (1994): The Shrinking Continent: New Time Space Maps of Europe. Environment and Planning B: Planning and Design 21, 653-673. Wegener, M., Kunzmann, K.R., Spiekermann, K. (1994): Wachsendes Europa - schrumpfender Kontinent. arch+ 122, 28-33. 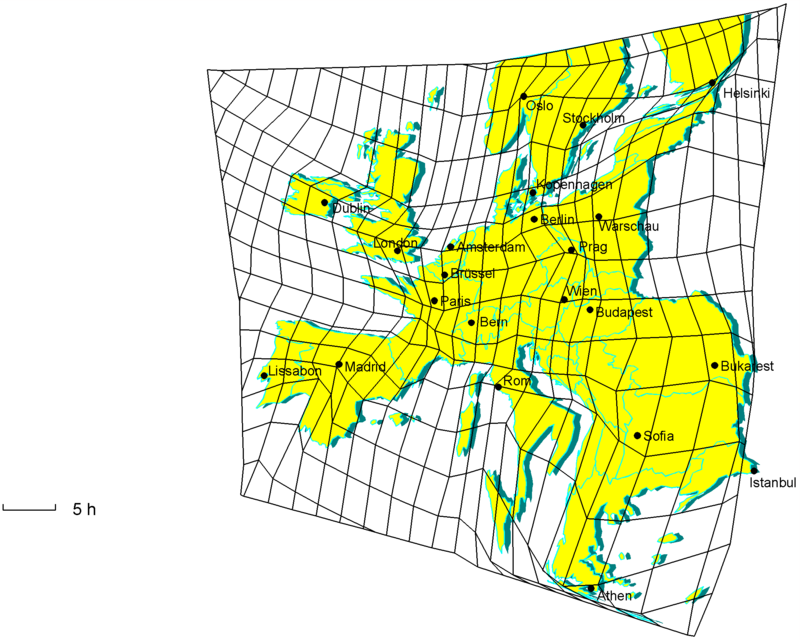 Spiekermann, K., Wegener, M. (1994): New Time-Space Maps for Europe. Working Paper 132. Dortmund Institute fo Spatial Planning, University of Dortmund. Spiekermann, K., Wegener, M. (1993): Zeitkarten für die Raumplanung. Informationen zur Raumentwicklung 7.1993, 459-487. Spiekermann, K., Wegener, M. (1993): Zeitkarten für die Raumplanung. Working Paper 117. Dortmund: Institute of Spatial Planning, University of Dortmund.